Disclaimer The Goldenear AON 3 speakers were loaned to use for review and were returned after to MLY Enterprises Inc.
We thank MLY Enterprises for giving us this opportunity. The loudspeaker we will be looking at today is the Aon 3 from Goldenear, a company based in Maryland, USA. The Aon 3 is a small speaker and is meant for smaller rooms or used as surround speakers in home theaters. There is another model, the Aon 2, which is even smaller. First, a bit of history. 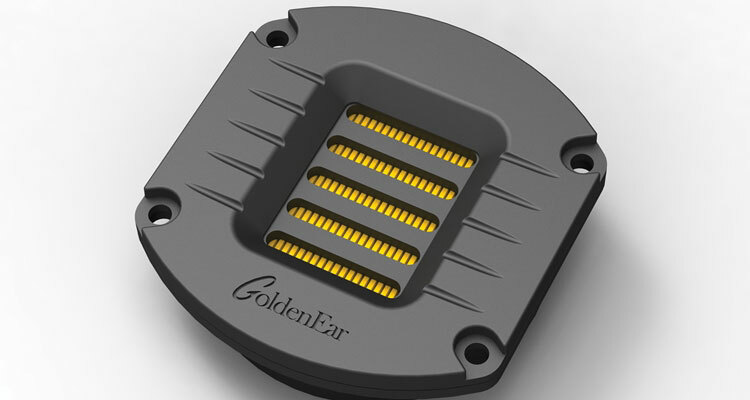 Goldenear is a relatively new company that benefits from decades of experience. It was founded in 2010 by Mr. Sanford “Sandy” Gross, an American loudspeaker designer who co-founded distinguished companies such as Polk Audio in 1972 and Definitive Technology in 1990. 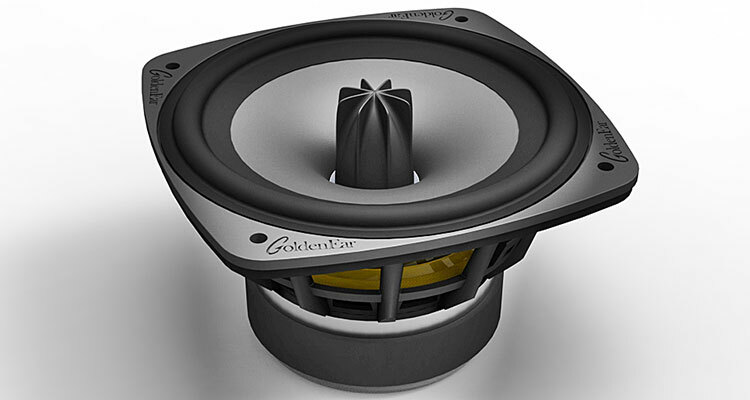 Goldenear’s goal is to apply advanced technologies to make affordable speakers that sound great. Based on their lower prices as compared to many high-end brands, they have certainly achieved their goal, with their products winning praise from major Hi-Fi magazines and reviewers and awards from over the world. Back to the Goldenear Aon 3 speakers. They arrived in individual cartons with foam insulation inside. Packaging is well-constructed and should withstand the mishandling that is common with many couriers. It is also well-labeled. A lot of information can be seen on the boxes. Inside are the Aon 3 bookshelf speakers. Bookshelf, meaning they are small enough to be placed on shelves or on wall-mounted speaker brackets. Of course, they will sound best on dedicated speaker stands. The Aon 3 measures 9″ wide, 11″ deep and 14″ tall and weighs around 15 lbs. Its machined MDF enclosure is shaped like a tall pyramid with its top half removed. This shape has several advantages. It helps to decrease the effects of diffraction and creates a more open sound. It also improves rigidity and reduces internal standing waves since only the top and bottom panels are parallel. From the front, only the Goldenear logo is seen at the bottom. An acoustically-transparent dark gray cloth “sock” not only serves as its grill but also covers all other surfaces except the top and bottom. On top is a removable plastic piece finished in elegant piano-black. Taking it off reveals the drawstring that allows the loosening and lowering of the sock. Once lowered, a 7-inch midbass driver and a folded ribbon tweeter reveal themselves. On both, the left and right sides are 8-inch passive radiators that serve to extend its bass response beyond what typical ports in bass-reflex enclosures can manage. On the back are a pair of exposed, chunky, gold-plated, metal binding posts. At the bottom are four round rubber feet, around 3mm thick. Like Goldenear’s other speakers, they are intended to be heard with the sock in place. Fit and finish are both very good. As a technology-centric company, Goldenear doesn’t simply buy off-the-shelf drivers and put them into a box. They design and manufacture their own. 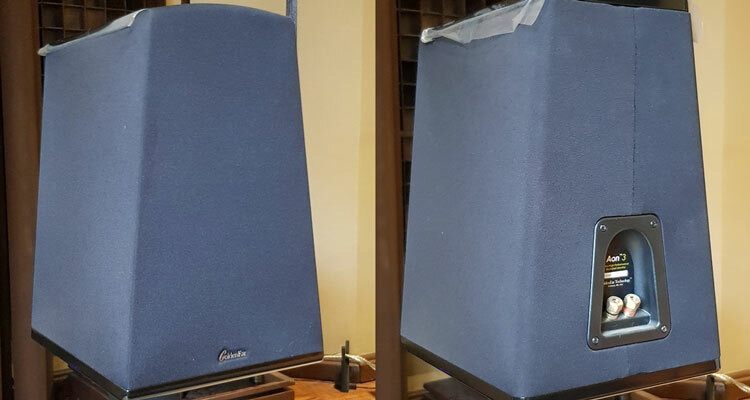 While not the most economical way to make loudspeakers, it gives them the freedom to do things their way and guarantees they meet their own specifications. Starting with the midbass, they used a cast basket for added stiffness and rigidity and a large magnet to increase its power handling. At the center of its geometry-optimized cone is their large, proprietary “MVPP,” or Multi-Vaned Phase Plug. Unlike a traditional dust-cap, it more evenly disperses the top range of frequencies reproduced from the center of the driver. The tweeters of the Aon 3 are not centrally placed, nor are they mirror-imaged. They are offset to the right by a few millimeters. According to Goldenear, sound waves from it that will inevitably bounce off the front baffle will not get a chance to amplify each other, resulting in smoother highs. While their larger speakers do have centrally-mounted tweeters, it shows that Goldenear went the extra mile to optimize the Aon 3. About that tweeter, while previously used by only top-dollar brands, folded ribbons are slowly making their way into more affordable examples like the Aon 3. They work by squeezing air between the folds of its membrane, all the way up to a rated 35kHz. Compared to conventional semi-spherical tweeters, it requires less power, its dispersion is more controlled, and harsh sounds that occur when the domes of regular tweeters start flexing, known as cone breakup, are no longer a problem. The User’s Manual of the Aon 3 rates its efficiency is 90db per watt per meter. This means when fed 1 watt, 90 decibels of sound will be heard from 1 meter away. This is actually high. 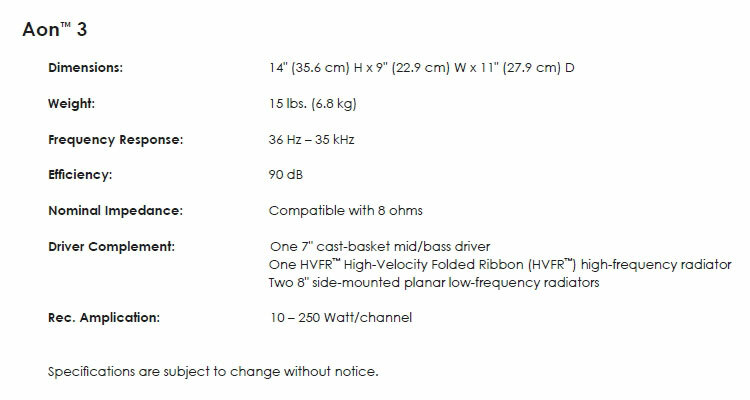 Most speakers its size manage only 82 to 86dB under the same conditions. The Manual also says its nominal impedance is “compatible with 8 ohms” and amplification of 10 to 250 watts is recommended. 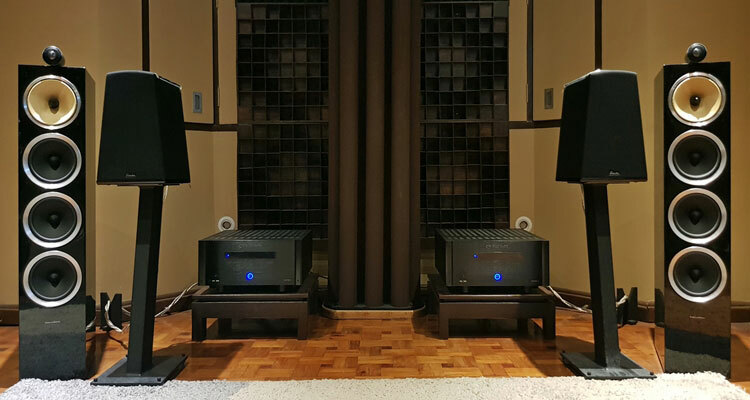 Suffice it to say, most amplifiers will be able to drive the Aon 3 quite nicely. Even tube or vintage ones. 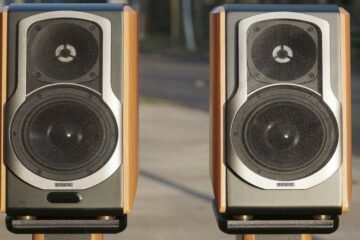 Both Aon 3 speakers were placed on heavy, sand-filled metal stands that raise the tweeter to ear-level and were positioned in the room where most bookshelf speakers sound best. The hours of legwork necessary to find that position was already done before. Here, the Aon 3’s inherently wide dispersion because of its narrow front baffle meant no toe-in was needed to achieve a wide soundstage and good image focus. 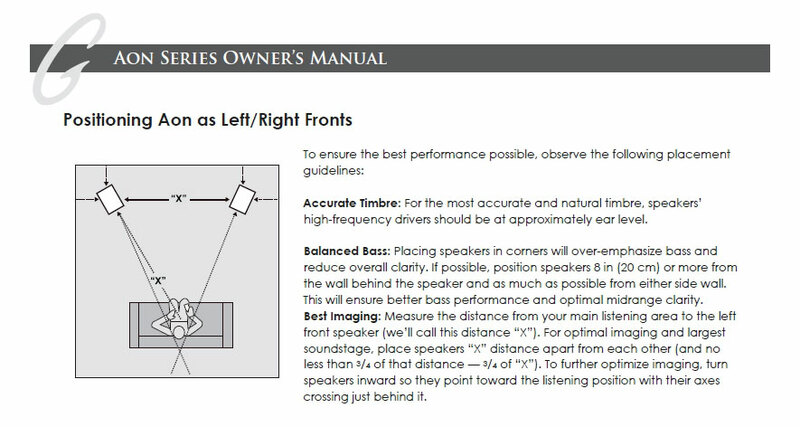 Toe-in refers to the aiming of the speakers towards the listener, and the User’s Manual recommends it. In my room, the Aon 3’s sounded good pointed straight ahead. In other rooms, of course, the best positions and toe-in angles will be different. Since they were new, I played pop and jazz songs (not test tones) at regular volumes for a few days before doing any critical listening. Not to worry, my listening room is sound-proofed. Folks outside won’t be able to hear anything, even if inside, music is playing loud. Yes, break-in is a widely-debated topic as it is in IEMs and DAPs, and the Aon 3’s already sounded good brand-new. But they did benefit from a few days of continuous playing. I made it a point to listen to them for around half-an-hour each evening. I played the same set of songs in the same order to detect any changes in the sound. As it turns out, there were. The bass gradually got deeper and a slight graininess in the highs slowly went away as the days passed. After roughly a week, there were no further changes. Two words I can use to describe the Goldenear Aon 3 are “coherent” and “efficient,” especially when compared with my Bowers & Wilkins CM10 S2. I could not tell where the sound of the midbass ended and where the sound of the tweeter began. With other speakers, it is easy to hear a certain driver call attention to itself. For example, the star of the show may be the tweeter as it may sound a whole lot better than the woofer. This was the case with another speaker I previously reviewed. And with others, the bass or the reproduction of vocals may be more appealing than its highs. Not with the Aon 3. Its midbass driver and folded ribbon tweeter both sang with a singular voice, a testament to its coherence. In fact, the sound of the Aon 3 came quite close to that of my larger and costlier B&W. I made sure not to touch the volume knob when comparing them. Also, the Aon 3 recreates a surprisingly convincing illusion of stage depth. With 60’s – 70’s jazz recorded live, it is easy to hear the lead instrument in front and the drums behind, with other instruments, clearly defined on the left and right. In short, the Aon 3’s sound expensive. Their only limitations were bass and power handling. As small speakers, they certainly won’t be able to fill large dens or living rooms with deep bass. In fact, they come with wall-mounting hangers so that they can be used as a side or rear speaker in home theater systems. Based on my listening, the Aon 3 speakers are best for rooms no larger than 15 square meters, unless an external subwoofer is added. But all this is perfectly acceptable for such small speakers. I imagine the ideal user to be a condo-dweller who wants to enjoy classic rock, jazz, pop, even classical music with good bass, excellent imaging and sweet highs from a small box with not a lot of watts. That last bit can be important for those who own tube amps since most of them don’t output more than 50. Fortunately, 50 watts are plenty for the Aon 3, especially in smaller rooms. What about the KEF LS50? Roughly the same size and price, and are just as highly rated, if not more. I heard those in different systems and they sound unquestionably good. I imagine the amplifier would be the deciding factor. At just 85dB/W/m, the LS50’s will sound best with a lot of premium power. The better and more powerful the amp, the better they will sound. While this is true of almost every speaker, the Aon 3’s need significantly less power because of its 90dB/W/m sensitivity and because its side-mounted passive radiators allow it to produce more bass than the majority of similarly-sized speakers, including the LS50. 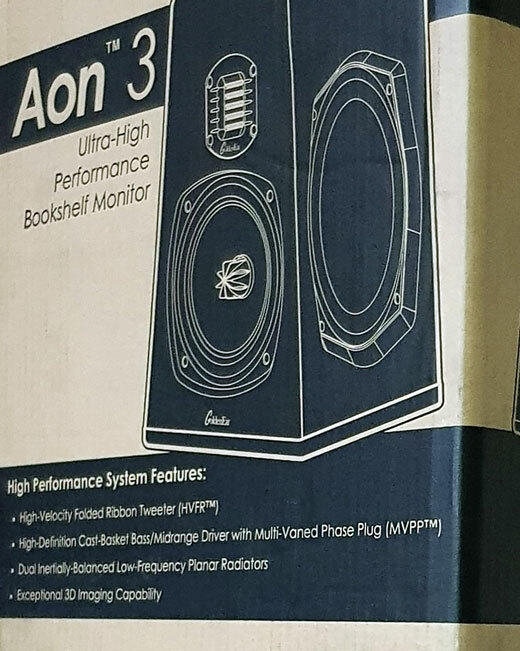 With its coherence, efficiency and good sound, the Aon 3’s represent excellent value for money. Highly recommended, especially for smaller rooms and with lower-powered amplifiers. Please contact your dealer to schedule an audition. Yes, my gear is definitely not high-end. 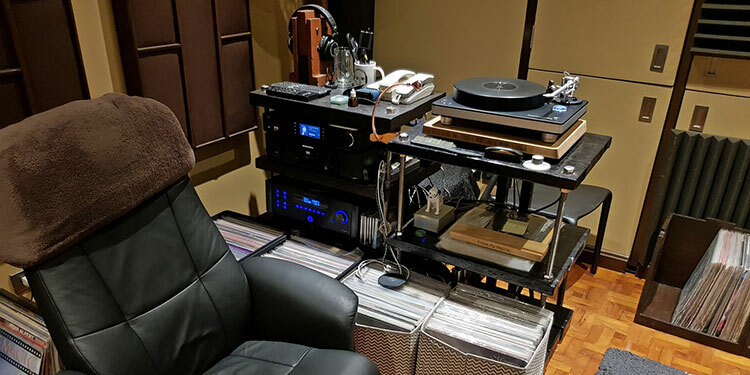 I do not currently own anything from exalted brands like McIntosh, Mark Levinson, and Wilson Audio, but with hard work, perhaps one day, I will. As for now, careful planning, sensible room acoustic treatments, and prudent component choices helped me to achieve good sound quality for not a lot of money. I listen to almost all genre of music. Jazz, folk, soul, R&B, pop, new wave, hip-hop, rap, rock, classic rock, indie, world, metal, even classical. In my collection spanning over two decades are roughly 20,000 CDs and SACDs and a couple hundred LPs. It was fortunate that those decades were also spent ripping my CDs to lossless, complete with the correct metadata and album art. The Cambridge CXN that I have in my listening room plays them nicely over the wired home network. Yes, I listen to more digital than analog, but only because I got my turntable just two years ago. I currently have a small but dedicated listening room at home. It was renovated a few years ago to acoustically ideal dimensions, soundproofed and treated with a variety of sound diffusers and absorbers. I use a selection of modern gear from brands like Bowers & Wilkins, Cambridge Audio, Marantz, Clearaudio and Emotiva. The goal was to have a neutral sound. The so-called “Goldilocks” sound. Not too warm and not too bright. Or not too heavy on the bass nor too light. Not too etched but not lacking in detail. And above all, zero listening fatigue but not to the point where it will put you to sleep. Many friends and acquaintances have visited my system. Some of them are shop owners who know that the majority of their customers have put together their systems to suit their own tastes. Also, for one reason or another, most of them are unable to acoustically treat their rooms. Some even find such treatments unnecessary, or an eyesore. After listening to my system, they are curious to know how their products will sound in a neutral environment, so they ask if they can send some over for evaluation. That was how I got into reviewing.